A business owner has to deal with a multifold of concerns, with the majority of these determine how successful your company is, on the overall. When setting up a company, the security doesn’t seem a big concern something people don’t mull over with great interest. But you latter you will discover how crucial it is to invest in advance commercial security systems to create a safe & secure environment for your employees to focus only on work while keeping people with bad intentions. Just when you think your business is heading in the right direction, thieves or an unfaithful employee can take away all your hard work. Why Consider Having An Efficient Alarm System At The Workplace? It makes great sense if you seriously consider investing a complete commercial alarm monitoring system at your office space when setting up a company. Not only, it will safeguard your important organization files and expensive equipment/inventory; also help you get great discounts on your workplace insurance coverage premium. If you are able to successfully define that your workplace is safe and secure from a wide spectrum of threats, the best insurance deal you can lock. Moreover, your staff will have complete peace of mind working in a safe ambiance. Investing in commercial alarm systems becomes even more important when valuable things are there in your shop overnight. Thefts are a major problem when it comes to commercial spaces. Not just externally, even your employees can indulge in such activities, especially if your business is about selling products. Every now and then, we come across employee wrongdoing to hamper a business’s revenue numbers. Over time businesses are losing thousands of dollars each, even without realising it. However, with the installation of the commercial alarm systems will deter such activities. Not just the working staff, individuals with the intention of stealing something enters commercial premises where gadgets or other products are displayed. Now, the CCTV camera system again comes to the fold, it will reduce the likelihood of thefts and if such an incident happens then it will provide evidence for the legal investigation. The most significant advantage of buying a commercial alarm monitoring system is owing to the automated nature of the advanced security systems. Commercial space owners will have complete peace of mind as the odds of break-ins and other security threats on the lower side. 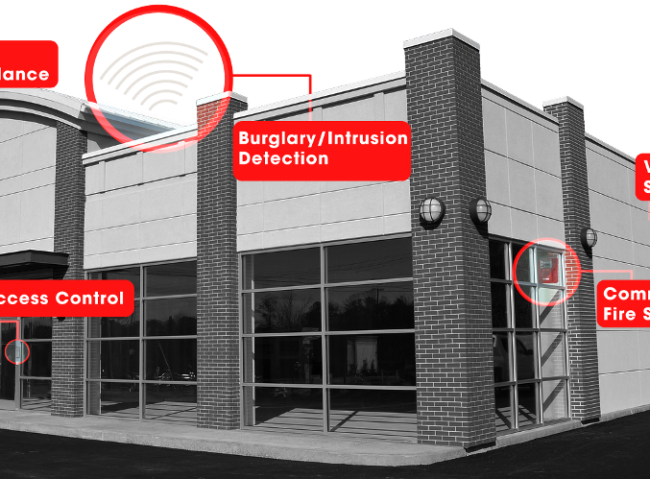 The security systems can be installed in line with your commercial place security needs and demands. Reach out to a reliable CCTV expert in your region to come to your place and determine how many CCTV cameras are required for comprehensive surveillance. Get multiple estimates, compare and then make the final decision.